A little over a week ago I received an exciting delivery from a very helpful eBay seller and his wife, who had driven all the way from Milton Keynes to Walsall to drop it off. A Commodore Amiga 1500 (aka A1500) computer, together with a Commodore 1940 bi-sync monitor and a crate of 1,000 floppy discs. Woo-hoo! For those who don’t know this particular tale, the Amiga 1500 (or A1500 as some designate it) was a model sold in 1990 only in the United Kingdom, as a marketing ploy to bring more Amiga owners into the ‘business’ sphere of Amiga production. It was, of course, simply a re-badged Amiga 2000 with two 3.5″ floppy drives instead of a single floppy and a hard disk drive (HDD). It had exactly the same features as the later ‘B’ issues of the 2000 (separate keyboard, expansion slots, big box and a big power supply being the most obvious) and the last production models included the slightly more advanced ECS chipset (as mine does). Apart from the white on black name label on the front, the only real difference between the 2000 and the 1500 was that the HDD was left out as standard but made available as an option, in order to bring the marketed price down to £999 (recommended retail price including VAT). In practice, most dealers had, it seems, already been selling the Amiga 2000 with the HDD as optional. I well remember that mine, which oddly enough I purchased in early 1990, included a 20mb HDD and the PC-compatible ‘XT Bridge Board’ with matching 5.25″ floppy disk drive which filled the bay occupied by a CD-ROM drive on my ‘new’ 1500. I can’t recall the exact price of this combination (which I purchased from Mr Disk of Bearwood, Birmingham), but it was being sold for £1399 including VAT at the time by Delta Pi Software Ltd, so around that figure or less. The marketing situation on the ‘professional’ Amiga front can’t have been helped much by discounting and grey importing of what was then known as the B2000 (also with the later ECS chipset). In the pages of Amiga User International for January 1990, Third Coast technologies of Standish, Wigan was advertising the bare B2000 at £685 (or £999 with keyboard and Tenstar games). Meanwhile, dealers Portfolio, who had several stores in England and southern Ireland, were busily flogging an “imported” B2000 for £599 + VAT. So, introducing a cheaper, introductory 2000 – the 1500 – as a ‘sprat to catch the mackerel’, was all fine and good marketing sense you might well admit. But where does the controversy come from? A little of this story has already leaked out, or at least conjecture about it has, but both this blog and my Amiga User International Facebook group can now play a small part in setting the record straight, as far as it can be (after all, this all happened a long time ago, in a galaxy far, far away), about the origins of the two A1500s. 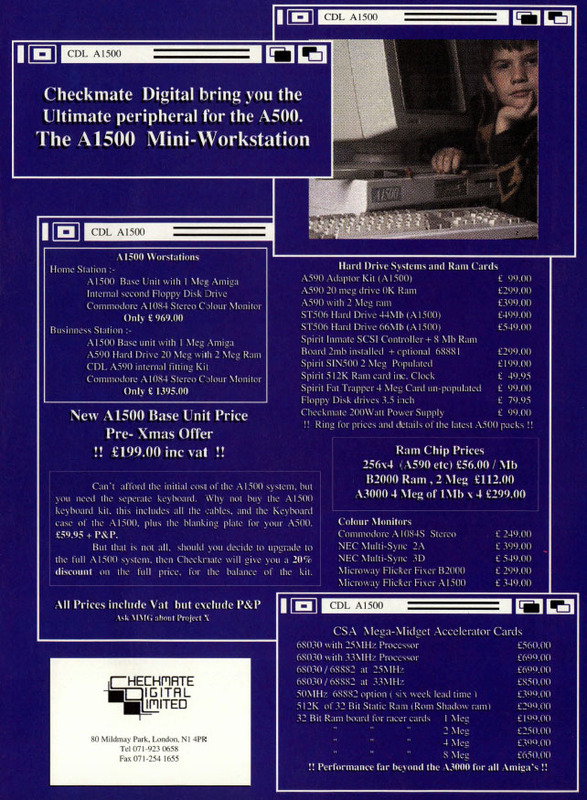 “In 1990, Commodore UK sold a variant of the A2000, the A1500, for £999. The model designation was not officially sanctioned by Commodore International. The A1500 shipped with dual floppy drives, and 1 MB of ChipRAM as standard. Initial units came with Kickstart 1.3 (and thus AmigaOS 1.3), though the Original Chipset onboard included a later Agnus revision allowing the 1MB of ChipRAM. Early machines were bundled with a Commodore 1084SD1 monitor. Later machines came with the ECS chipset and AmigaOS 2.04. The second floppy drive replaced the hard disk drive. The A1500 had no hard disk drive as standard. The reason for the UK-only release may have been the existence of a desktop upgrade kit for the Amiga 500 made by Checkmate Digital and also called A1500, and Commodore trying to keep the name for themselves.[speculation?]”. Antony Jacobson, the respected editor of Amiga User International, was very supportive of companies creating third-party kit and software which pushed the Amiga beyond its ‘games machine’ image. So it was that the Checkmate ‘A1500’ came to be publicised – and advertised by the company – in the magazine in March 1990, as these two cuttings show. But what is the real story behind this controversy surrounding both the A1500 and Commodore’s own Amiga 1500, and the supposed ‘David v Goliath’ clash between Checkmate Digital Limited and CBM UK Ltd? Following my posting of the item about the Amiga 1500 on the AUI Facebook group, I was delighted to see comments on the matter both by David J. Pleasance and, amazingly, from Stephen Jones, whose company Checkmate Digital was. “…whilst I have always smiled about this story few people know the actual truth, Anthony Jacobson [editor of Amiga User International] did and he thought it was hilarious. Myself and James Campbell set up Checkmate Digital in London to market a great product called, yes cheekily, the Checkmate Digital 1500 as a machine that could out perform PC’s and emulate Mac’s better than Apple, but also nearly half the price of the equivalent Amiga 2000 which was very expensive at the time. I managed to get a lot of PR from the magazines of the time and we went to business trade shows where Commodore were missing and impressed huge numbers of architects and designers by demonstrating XCad and Caligari running on a flicker fixed, 33mhz 030 with maxed out ram and SCSI drive based Amiga machine using an A500 in one of our CDL1500 chassis. When the demo ends, I tell them the price, they then want to buy the product. Unfortunately as soon as I mention the computer the comment was always the same, I cannot get my financial director to by an Amiga, thats a games machine, and not the “It’s not an IBM” comment people used to say. “Though you do not say exactly when this meeting took place, I am certain it was with Kieron, as he was with the Business Systems Division, and I know the A1500 was one of his initiatives. Kelly worked for me in the Consumer division, until I went to Commodore International in Switzerland in 1990. Without discussing it with Kieron I am not sufficiently informed to be able to make any meaningful comment. It does sound (from what you have said) to be a very different conversation than CBM UK have a very good reputation for having. We used to actively encourage any new development and we have an excellent reputation for out relationship with developers. Of course until I returned to CBM UK as MD (after 2 years as General Manager CIL in Switzerland, and 1 year as Vice President Commodore Inc in Westchester USA, I personally had little to do with the Business Systems Division. This is in no way passing the buck, it just happens to be true. However I completely disagree with your viewpoint about how we marketed the Amiga only as a games machine. My responsibilty was to generate as much revenue for the Corporation as possible. The products I had to deal with were the entry level machines of the Amiga Range, and we promoted it as the “Must have” computer for all ages, which is why we always included good productivity software such as Word Processing and Art, There is no doubt whatsoever that by getting so many Amiga 500 and A1200 machines into homes, we spawned a generation of would be programmers, many of whom have gone on to build immense careers in IT. When it is released, take a look at the new Documentary from Anthony and Nicola Caulfield (From Bedrooms to Billions fame) “The Amiga Years” which is due for release prior to Xmas. This supports my opinion. At the end of the day everybody will undoubtedly have their own opinion about what was done and what was not done correctly. I maintain and always have, that Commodore’s Corporate demise was down to never having any kind of plan. We used to have to stumble from one crisis to the next always putting out fires, from the most stupid of decisions made by people who never had the faintest idea of what they were doing. Through all of that I had 12 years with Commodore and for the main I loved every second of it”. So, there you have it – or as least so far as can be remembered by two key players on the British Amiga scene back in the day. Now, there’s a lot more to this conversation [and there may even be someone else out there from the Commodore side who knows more specifically about their 1500] but what has been said by David and Stephen has wider implications than just the Amiga 1500, so may I encourage you, dear reader, to check out the post and comments about this in the Amiga User International Facebook group, I am sure you will find them as enlightening as I did – including what Stephen has to say about the remarkable Siamese system which Checkmate Digital went on to produce later. What happened to the Commodore Amiga 1500? What happened to the Commodore Amiga 1500 after this, then? It’s generally held that it was only sold as such in 1990, and that makes a good deal of sense, because competition for both the 1500 and 2000 was coming from the new kind on the block, the Amiga 3000. Released in June 1990, the 3000 featured improved processing speed, improved rendering of graphics, and a new revision of the operating system. The 3000 is mentioned in adverts in the Amiga User International issue for August 1990, but there is no indication of price so perhaps it was a while coming. By August 1990, perhaps all the kerfuffle about re-branding the 2000 as the 1500 had become a bit moot anyway. The Amiga 1500 was still on sale but not being heavily promoted. In Amiga User International that month is an ad by Hobbyte of St. Albans, where it is being sold with a 1084SD monitor and a pack of software for £949. Still not bad value for the standards of the time, if you really needed all that expansion potential. Not quite so competitive was the offer from Firstchoice of Leeds, of a similar packages for ‘only £1089’. Despite the arrival of its newer, high-tech relative, the Amiga 2000 continued to be marketed (at a lower price, naturally) for a while, but both it, its short-lived variation the 2500 and the 1500 were phased out soon enough as Commodore aimed higher. The 3000 itself, which didn’t have quite as many expansion options as the 1500 and 2000, was expanded upon by a tower version, the 3000T, in 1991. Both 3000 models were phased out in the autumn of 1992, when the 4000 arrived, but that is another story. And what of the ‘other’ A1500? Anyway, although this intriguing tale of those long-lost days of the home computer revolution is all water under the bridge now, I thought it would be both fun and timely to celebrate the 25th birthday of the Amiga 1500 with a story of marketing, mischief, machinations and mystery inspired not only by the arrival of my own 1500 but also by the pages of Amiga User International, the magazine for which I was privileged to write way back when. I hope you’ve found it as fascinating as I have! My personal opinion on the matter is that both the Checkmate A1500 and the Amiga 1500 were great ideas and made good marketing sense. Whether you agree with the alleged tactics of at least one part of Commodore Business Machines UK in regard to the ‘clash’ between the two is a matter for you, dear reader. Personally, if I had been an Amiga 500 user at the time, I would have found the A1500 expansion system very tempting. As it was, I was a user of the original Amiga 1000 and subsequently the 2000, so would probably not have gone either way ‘back in the day’. One final question worth asking is, how many Commodore Amiga 1500’s are still in existence today? Perhaps not that many, as I’ve only seen a couple of them on eBay in the past year – and one of those is now mine. Also, an interesting question is how many of Checkmate Digital’s A1500 systems are still out there? There must be a few, as they can be found here and there, pictures of them at least, via Google. Do YOU own a Commodore Amiga 1500 or a Checkmate A1500? I’d be interested to know, so please feel free to comment below! I would like to thank David J. Pleasance and Stephen Jones for their kind permission to quote them ‘from the horse’s mouth’ in this AMIGA meditation, as without their help this small insight into the history of the Amiga would not have been possible. I have a 1500 stored in London, and is standard apart from having an expansion so various kickstarts can load (I think 1.2 and 1.3). I`ve been up in Scotland for the last ten years so seriously need to collect and bring up as im reading about battery leakage in the big box amiga`s. Very interesting read. Ive got both of them. An A1500 with 030 card, Picasso 2, indivision ecs and a buddha ide card. My Checkmate 1500 is using an A500+ board with indivision ecs and a ide interface board which as got 8mb on board and a compact flash card with WB3.1 installed. I would never get rid of either. Many thanks for the interesting read. Lot’s of interesting information concerning the A1500. Never seen one in real life, but remember seeing it in ads in various British magazines back then. I too own a 1500, it is still boxed, it currently resides in the loft inside its original multicoloured box with tutankhamun’s eyes peering at you through the gloom! I purchased for my two boys, who were then at high school, as I was keen for them to get the best for games but more importantly, use of a computer as this was the future! Purchased in 1990 at the Commodore business store in Charles street in Leicester, I bought as much as I could afford, so it came with a Phillips (Not Commodore) colour monitor and a Star 200 dot matrix colour printer (All still boxed) It hasn’t moved for a while and I understand they have a tendency for their battery to leak over time? It came with an early version of Microsoft “Works” WP manual and SW.
And as for the boys? Well, the youngest is a lecturer teaching apprentices for Volvo and the eldest has completed his Phd in design after a Ba1:1 and distinction in his MA each in Design so thank you DELUXE PAINT III ! Hi Stuart, I’m currently making a video with Stephen’s involvement on the history of the A1500. Would you kindly allow me to use some of the quotes from this blog page if I provide a credit and link back to it? Many thanks.